Alright people, I'm definitely in Babywatch 2008 mode. I'm at 8.5 months now, which means baby could arrive at anytime [insert dramatic music here]. My cooking has reduced even more than it was last week, mostly because of running around trying to tie up loose ends. If I could just find a lamp I like for baby's room, I think I would be golden.... 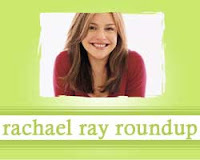 Enough about me, on to what's up with Rachael Ray! This is a great idea. Deborah of Taste and Tell tried all of the recipes from Every Day with Rachael Ray's 7-day menu planner and is posting about them this week. Boston Chef tried Lamb Chops and Mint Mashed Potatoes from Rachael Ray's recipe archive. Kristina of The Chocolate Peanut Butter Gallery made Rachel Ray’s Peanut Butter Poodle Pancakes from the August 2007 issue of Every Day with Rachael Ray. Mom Cooks - Recipes that Rock features another recipe from Every Day with Rachael Ray, this time for Chicken Taco Patties. Jenn posted a review on Travel Pod of Rachael's favorite restaurant in the world, Il Latini in Florence. Jenny at All Things Edible tried four recipes from 365: No Repeats - Mega Meatball Pizza, Citrus-Marinated Chicken and Orange Salad, Smoky Turkey Shepherd's Pie, Island Bird: Pineapple-Rum Chicken, and Sausage and Spinach Pastry Squares. Endless Simmer pits Giada against Rachael in a contest to see who makes the best scallops wrapped in bacon. Cate of Sweetnicks is back, this time with a test of Rachael's Power Burgers, which Cate calls Pizzaiola Burgers. The Kitchen Illiterate tried Rachael's recipe for Jambasta, but decided to call it Jambalaya Pasta instead. Cook. Craft. Enjoy. features a creative use for some leftovers - Rachael's recipe for Nacho Bread Pizza. What a thrill to see my post here! I want to try the Peanut Butter Poodle Pancakes, peanut butter plus pancakes sounds delicious! I added your link to my blogroll at MomCooks, too. Thanks for the post and for the link, Elizabeth!